This busy network office continued to hum while Crestwood Painting quietly did their thing. Next, clear communication: caution tape, temporary barrier walls as needed. Because nobody wants Pacer White on their blue sweater. Your office, your noise – you don’t need painter noise, too. There’s no radios, no banging and clanging – just well-planned painting. And then we leave. No Drips, No Drama. Servers, monitors, cabling – We’ll cover everything with the appropriate material (light plastic over that graphics monitor, not a cruddy drop cloth) and be sure to steer clear of anything that’s plugged in. File cabinets – We’ll move them (when possible), paint around them or arrange to have them moved while we do our thing. Just let us know what you’d prefer. The short answer is that office painting in Kansas City is generally about $600 per painter per day. 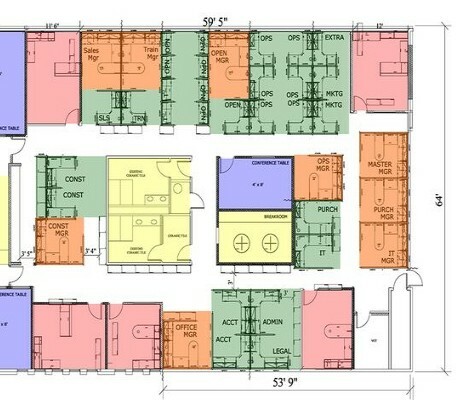 Generally, you can expect the walls in one larger room (lunch room, conference room, etc.) and a smaller office to be completed on one day. 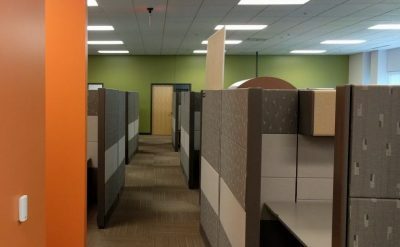 Crestwood Painting screens our painters so that you’ll only have the kind of painters your office staff can feel safe with. We do hire nice people that enjoy their co-workers and take pride in doing a great job. We don’t hire thieves, we don’t hire felons – criminal background screens make sure of that. All employees communicate clearly in English and wear professional painters’ white pants and Crestwood Painting uniform shirts. Safety matters so we make sure to train our employees on how to safely work in office environments. We’ll use the right ladder for hallways, the right ladder for stairs. We’ll use caution tape to flag an area so your nice office people don’t wind up in our wet paint. Drop cloths when they’re needed, doors closed where possible. We’re even equipped to set up temporary barrier walls if that’s a better option. Some goofs are easy – wrong color, for example, is really no big deal. Or the alarm goes off – we’ll contact the right people and take care of it. Other glitches (like paint drips or [gulp] spills) are more of a challenge. But we’ll address it head-on and remedy the situation in a timely manner. 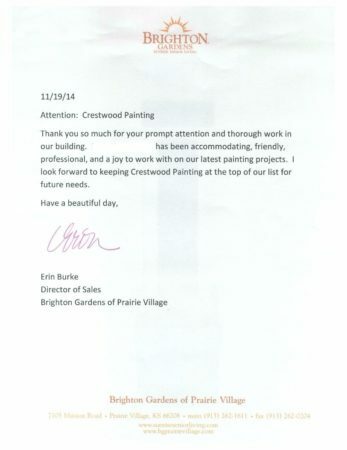 Call Crestwood Painting for your office painting needs. We’re an established and proven company with a reputation for safe, on-time production results and delighted customers. Call today to look into a No Drips No Drama experience.